There are 15 people who show GREECE as their place of birth in this Ancestry.com database. I have transcribed their names and listed them below. If you do not have a subscription to Ancestry.com, most U.S. libraries offer access for FREE.. 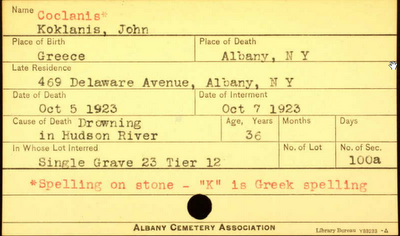 This database contains burial cards recording details on people interred in the Albany Rural Cemetery. 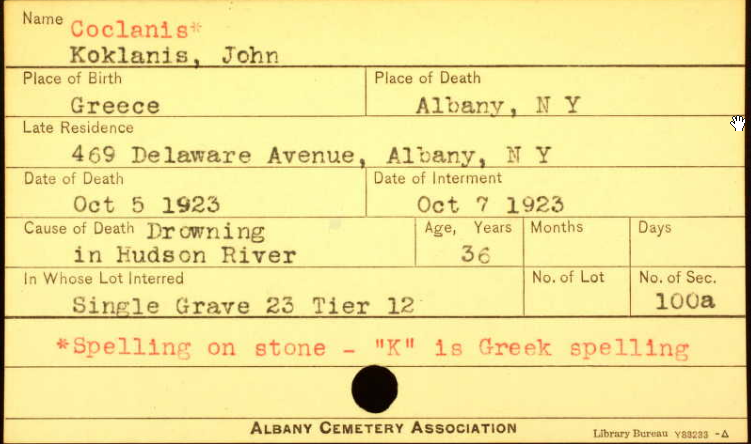 The typewritten cards contained in this database catalog all internments at the Albany Rural Cemetery in Menands, New York. The cemetery was incorporated in 1841 in response to two needs. As church burial grounds filled, a city cemetery was opened in the 1780s. When this proved inadequate, another municipal cemetery was established in 1801, and many of those previously interred at the old cemetery were moved to this site. However, because of flooding problems at the 1801 site, Albany Rural Cemetery was created, and bodies were moved again from the 1801 cemetery to be reinterred at the present site. Information was sometimes recorded on the back of the cards as well, so if you find an ancestor, you will want to use the arrow keys to check both sides. If there were no details recorded on the back of the card, it was not scanned and will not be included here.